Inspired by yet another blatantly biased piece on unschooling, and the ridiculed menu choice therein, we had a simple dinner in solidarity with unschoolers everywhere. (Oh the irony! We unschoolers, we're so sheltered and unsocialized, we simply don't know any better! On a side note, it never ceases to amaze me that those that screech about learning, keep failing at learning.) 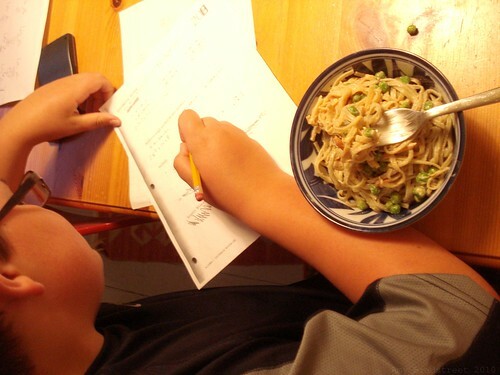 As it happened, the kids wanted help with their fractions and algebra (see, irony), they ate and did math! Here's the basic recipe, which changes just about every time I make it, based on what's in the pantry and veggies I have on hand. It's a flexible recipe, adjust accordingly. Blend, food processor or stick blend above ingredients. Prepare udon, soba, glass, spaghetti or similar noodles to taste. Drain and rinse in cold water, drain. steamed snow pea pods, frozen peas (steamed), grated carrot, sliced cucumber, chopped scallion, chives. 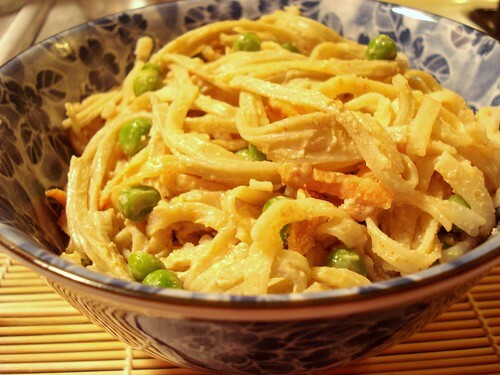 Toss in bowl with peanut sauce and noodles, serve. Now that dinner is done, we'll probably stay up late discussing Bradbury's Fahrenheit 451, because that's what our two unschoolers are reading currently. See, irony. This is great. The recipe sounds really good. Sounds like some of the conversations I have with my kiddos. Ours were on dinosaurs and where they lived and what they ate. And what it would be like to live with them. thank you for this recipe....I get a big F when it comes to anything like this, but your recipe may let me conquer the continent of food I cannot cook! Lurve. This post is full of Win. I read the tweet-fest dissing unschool while my kids were learning how to play chess (they're 6 and 8) and the youngest was counting by 11s aloud. Those pore children. They don't stand a chance. Seriously funny! You crack me up! I was so proud of Dayna and Devon. They held their center so well in the face of clear bias. I read the article you referred to. My 9 year old is finishing up 4th grade today at public school which is fine with us, that's how we roll. However, I had more fun reading the comments that followed the article you mentioned. There were lots of folks trying to get their point across about how important school is, yet many of their wds wer mispelt and lots of wrng uses of wrds such as to, too, two, lose, loose. They didn't really make "there" point. BTW, I make noodles with spicy peanut sauce . . I thought everyone did. LOL. Grace and Peace!